Users who don't want to spend a lot of money on a notebook don't need to look very hard these days - the supply seems nearly unlimited. 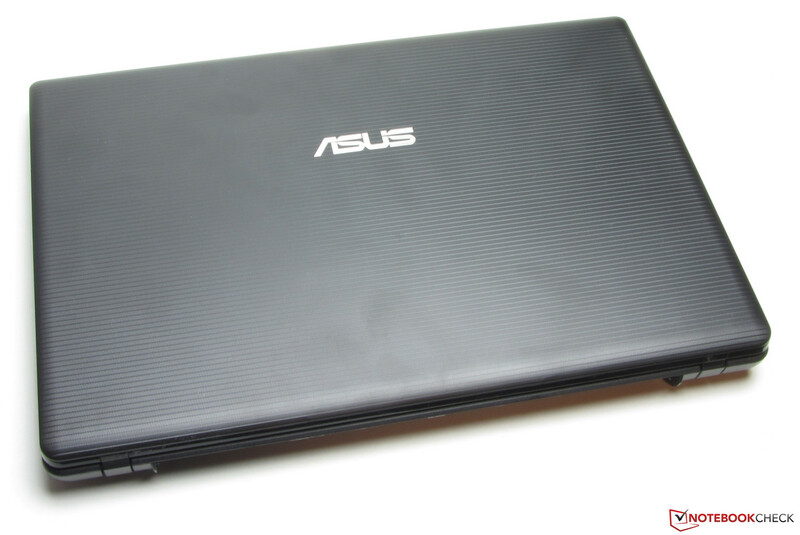 Asus adds yet another inexpensive notebook to the mix: the 15.6-inch Asus X55U. The models in the X55U series feature AMD components but are otherwise identical to the Intel-based F55A and X55A series. 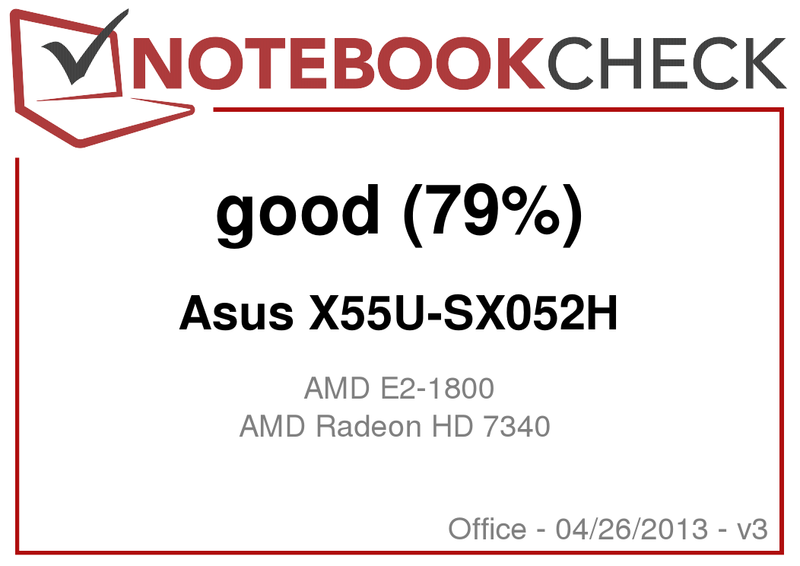 We already reviewed the F55A-SX099D (Pentium B980, HD Graphics, Sandy Bridge) and the 17.3-inch Asus F75A (Pentium B980, HD Graphics). For our review, we pit the X55U against two competitors: the Acer Aspire V5-551-64454G50Makk (AMD A6-4455M, Radeon HD 7500G) and the Toshiba Satellite C850-1LX (Celeron 1000M, HD Graphics, Ivy Bridge)). Both models are available for less than 400 Euros (~$520). We already took a closer look at the chassis when we reviewed the F55A. 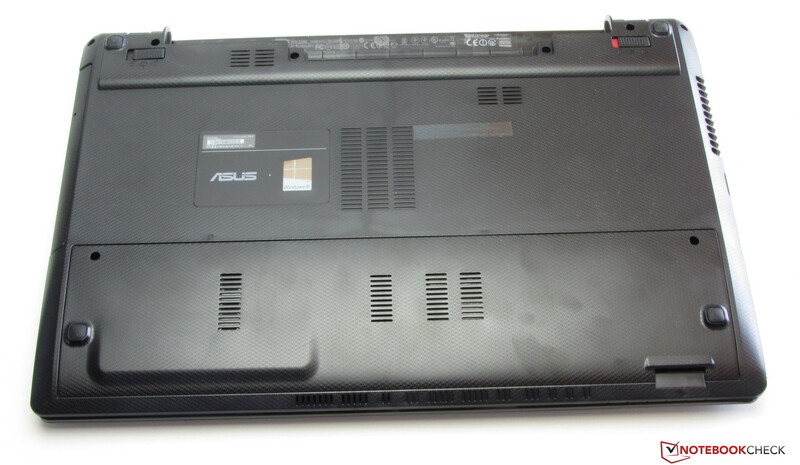 Asus uses matte, black plastic throughout. 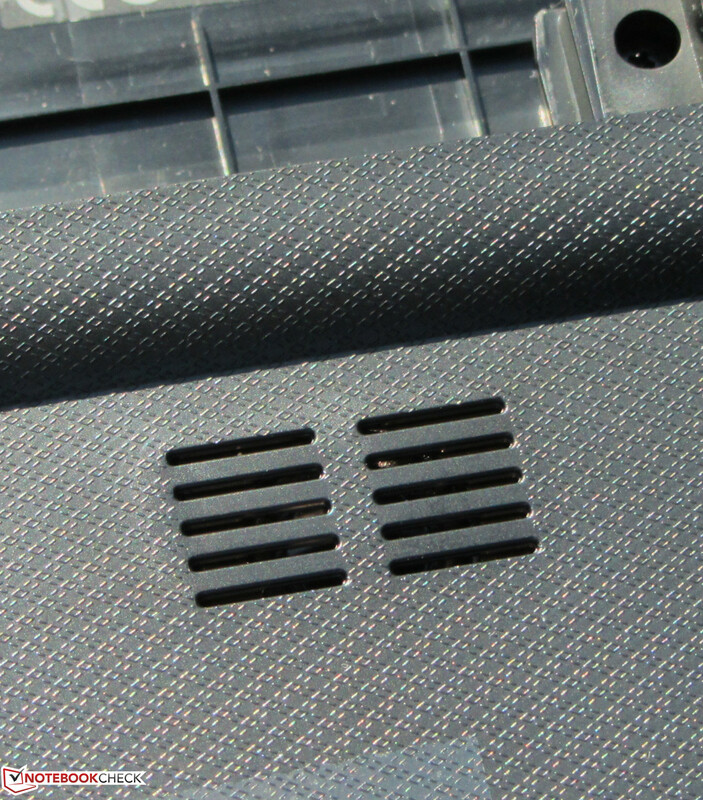 The back of the display lid and the palm rest are textured. Both the Aspire and the Satellite are also plastic - higher-end materials like aluminum can't be expected in this price range. The base unit is not particularly sturdy and flexes in some areas when pressure is applied. Both the base and the display lack in torsional rigidity. The hinges hold the lid securely in position - although we observed a little bit of display bounce. We were able to open the display one-handed as long as we proceeded slowly. The back of the display is textured. The maintenance cover on the bottom. The three notebooks mentioned in this review have similar connectivity options and feature one USB 3.0 port each. While the Satellite and the Aspire are each equipped with two USB 2.0 ports, the X55U has to make do with one. The Satellite is the only notebook with Fast Ethernet; the Aspire and the X55U have Gigabit Ethernet on board. All ports are located on the left side towards the front, which is far from ideal, as the workspace can get crowded quickly. Left Side: power jack, VGA, HDMI, Gigabit Ethernet, USB 2.0, USB 3.0, microphone jack, headphone jack. 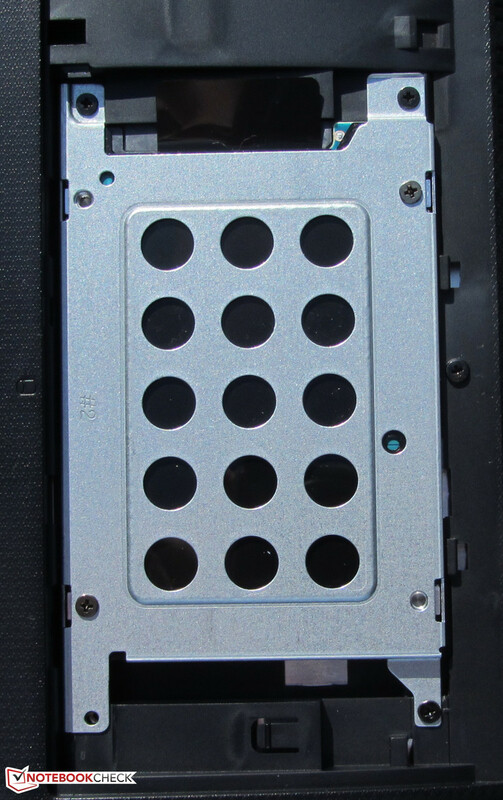 Right side: DVD-RW drive, Kensington lock slot. The WLAN module from Ralink (RT3290) supports standards 802.11 b/g/n. We didn't experience any issues with the reception - on the contrary: the Windows signal strength indicator showed all five bars no matter if we were 3 meters (10 feet) away from the router (transmitting power: 50%) or two floors below it. Cable-bound connectivity is handled by a Gigabit Ethernet controller from Atheros (AR8161/8165). Bluetooth 4.0 is also part of the package, as is a webcam with a resolution of 1280x720 pixels. Unfortunately, the webcam doesn't produce very high-quality pictures. Acer supplies a 30-page manual for Windows 8 for those users who are unfamiliar with the new operating system. A hardware manual and a pamphlet with warranty information are also included. The notebook comes with Windows 8 (64-bit) preinstalled; a DVD containing the OS is not included. Windows 8 recovery allows the user to restore the system back to default or repair any issues. To initiate the recovery, the user needs to hit F9 repeatedly during booting. 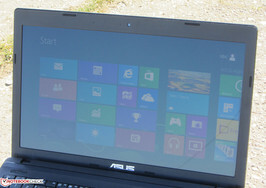 Asus not only supports Windows 8, but also Windows 7. 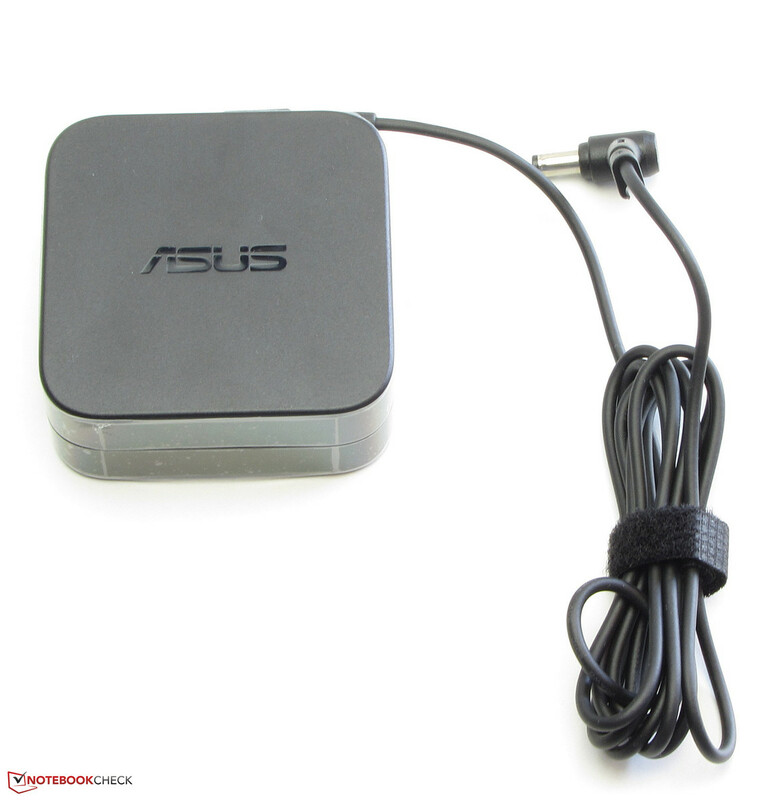 The necessary drivers for both operating systems can be downloaded from the Asus support website. The notebook should also make Linux users happy: when we tried an install of Ubuntu Linux 13.04, most of the hardware - including the WLAN module and function keys (brightness control, volume) - was instantly recognized. Only the Bluetooth module didn't work. 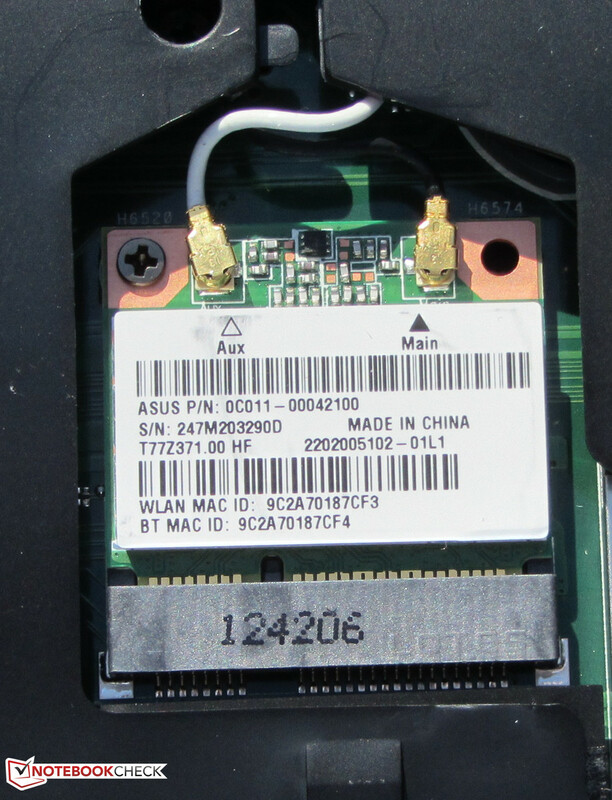 After the removal of the maintenance cover, the RAM, the hard drive, and the WLAN module are easy to access - although the fan is not. 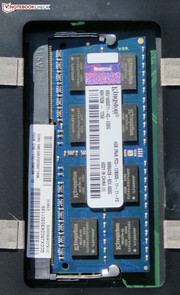 The notebook has only one RAM slot, which is occupied by a 4 GB module. According to Asus, 4 GB is also the maximum RAM supported. A second slot would not improve performance, since this particular AMD APU only supports single-channel mode. Intel processors and AMD A-series APUs also support dual-channel, which utilizes both the CPU and the GPU better and thus leads to an increase in performance. Swapping the hard drive for a different model is also no problem: all common 7 and 9.5 mm 2.5-inch hard drives would work just fine. In some countries, the X55U is protected by a 12-month warranty which includes pick-up and return service. Both the Aspire and the Satellite are covered for 24 months. The base warranty can be extended to two and three years for around 30 and 80 Euros (~$40 and ~$100) respectively. 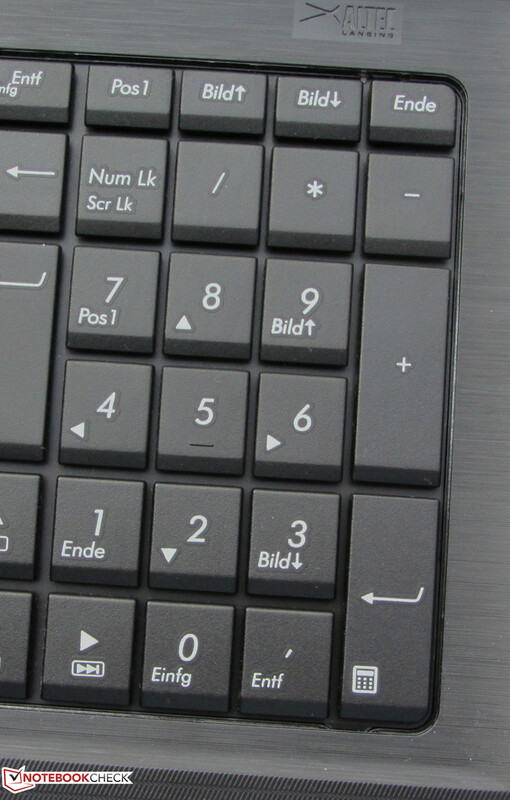 The keyboard of the X55U is a carry-over from the F55A and thus unchanged. The main keys measure 17 x 14 mm (0.67 x 0.55 inches), feature medium travel and offer good feedback. However, we would prefer a tad more resistance. Some keyboard flex is noticeable - especially towards the middle. 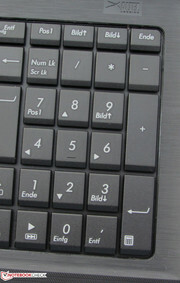 The multitouch-capable clickpad measures 10.5 x 7.3 cm (4.13 x 2.87 inches). The smooth surface allows fingers to glide easily and the size makes multitouch gestures a cinch. The gestures can be activated individually in the configuration menu. 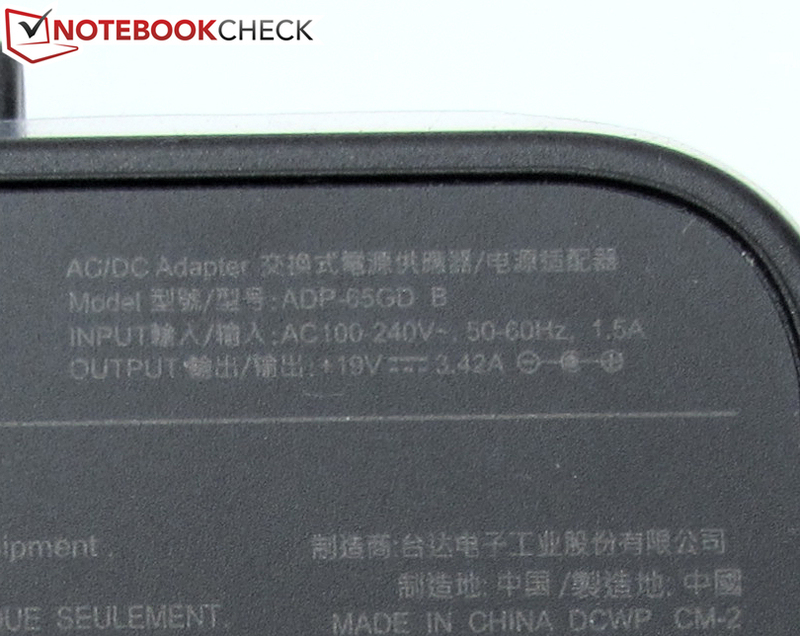 The difference between a regular touchpad and a clickpad lies in the fact that a clickpad doesn't have individual mouse buttons - rather, the whole surface is clickable. 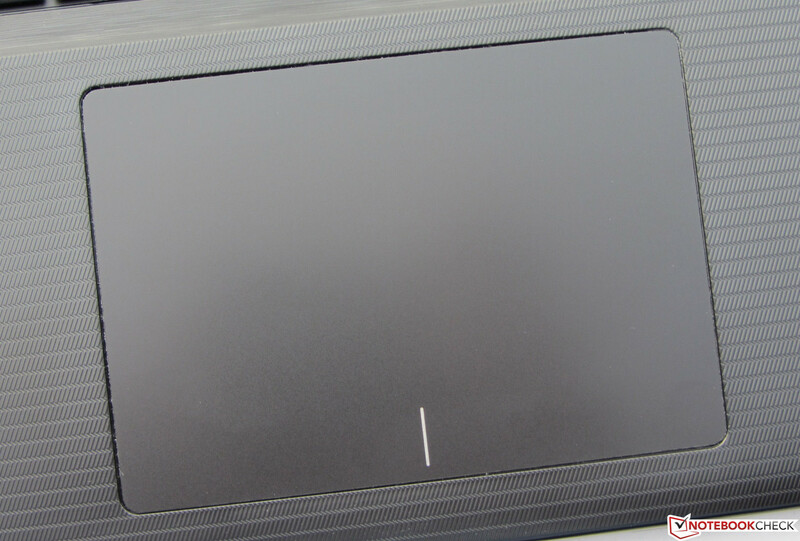 The pad is able to recognize the finger position in the lower part and hence if the user clicked left or right. The travel is very short and the actuation can be both felt and heard. We measured an average brightness of 207.2 cd/m² for the glossy 15.6-inch display, which is just about average. 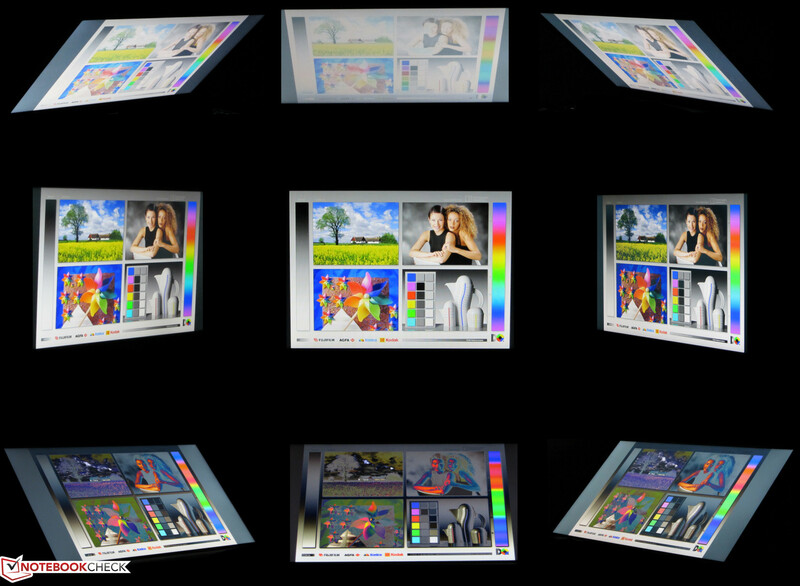 The screen features a resolution of 1366x768 pixels - other resolutions or panel types are not offered. The displays of the Aspire (192.7 cd/m²) and the Satellite (184.4 cd/m²) are a little less bright. While the display brightness is just average, both the contrast (734:1) and the black level (0.29 cd/m²) are quite decent. Both the Aspire (904:1, 0.23 cd/m²) and especially the Satellite (1094:1, 0.18 cd/m²) outperform the X55U in this regard. 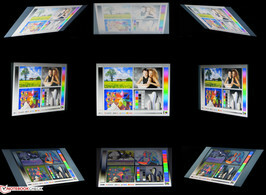 The display cannot reproduce the professional color spaces sRGB and AdobeRGB. Next, we took a look to see how the display handles colors (we use sRGB) out of the box: unfortunately, almost all colors deviate clearly from their ideal DeltaE-2000 values. Only yellow is where it's supposed to be (DeltaE less than 5). The display suffers from a bluish cast. 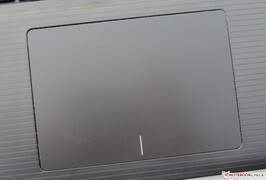 The combination of high contrast and sufficient brightness allow the user to read the screen content even when the notebook is used outdoors. A deviation in the vertical plane causes a deterioration of the picture quality more or less immediately. Horizontally, the viewing angle stability is better - we were able to decipher the screen content at almost 180 degrees. However, the display does darken significantly. Even though the AMD APU is not particularly powerful, the CPU/GPU unit should still be sufficient for daily tasks such as internet communication, office-type work, browsing, and video playback - according to the spec sheet also in Full HD. To test the latter, we used the tool DXVA Checker with HD material (1920x1080 pixels, H.264 encoding) and recorded a CPU utilization of 8%. Our review model sells for around 350 Euros (~$450). Asus offers additional models in the X55U series with different APUs (E2-1800, E1-1200, E-450, C-60), hard drive sizes, and operating systems. The least expensive version utilizes the AMD C-60 APU, 320 GB hard drive, and Linux and retails for about 280 Euros (~$360). To get an idea of how our notebook would perform with the C-60 APU, we include a netbook equipped with the C-60 in our comparison. 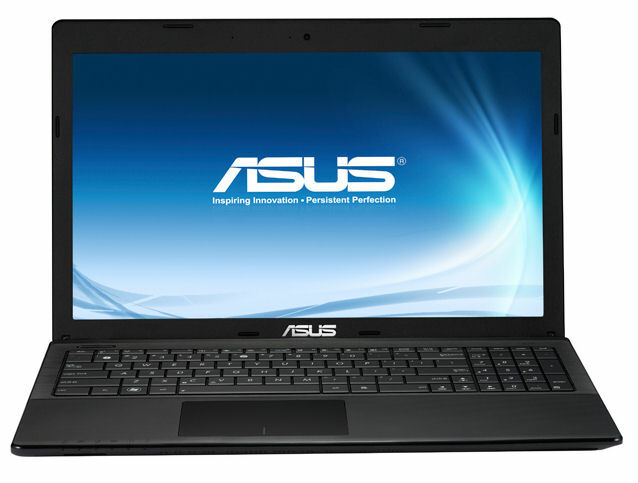 Interestingly enough, Asus only offers APUs for the X55U which are predominantly used in netbooks. Users who like the notebook but need more power should take a look at the F55A or X55A, which also start around 280 Euros (~$360). Asus uses AMD's E2-1800 APU. The CPU section is a dual-core unit with 1.7 GHz and a TDP of 18 watts - close to the power requirements of Intel's ULV processors (17 watts) - but not nearly as powerful. A Turbo mode is not offered. During the Cinebench tests, the processor maintained a clock speed of 1.7 GHz. As expected, the X55U scores the lowest in the synthetic CPU tests, while the Satellite (Celeron 1000M, HD Graphics) with the most powerful processor outperforms the competitors in our review. 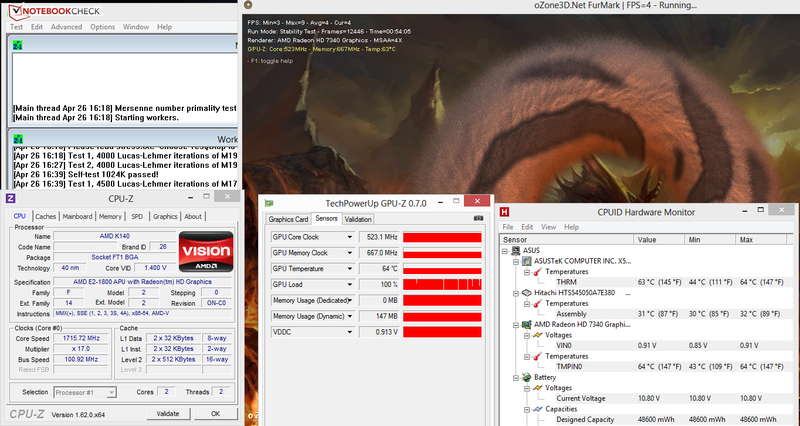 The scores of the Aspire (AMD A6-4455M, Radeon HD 7500G) fall in between the other two notebooks. The X55U received the lowest scores again in the GL test, since its GPU isn't very powerful. The Aspire scores the most points - the Radeon 7500G GPU outperforms its Intel counterpart. The notebook performs most tasks without major delays or lags. Only when the CPU is heavily utilized - for example when multiple browser windows are open - does the system slow down. Running PC Mark 7, the X55U scores about as many points as the Aspire (AMD A6-4455M, Radeon HD 7500G) - a bit surprising, since the Aspire actually has the more powerful APU. The culprit is the Aspire's very slow hard drive. The Satellite (Celeron 1000M, HD Graphics) does much better in this test. 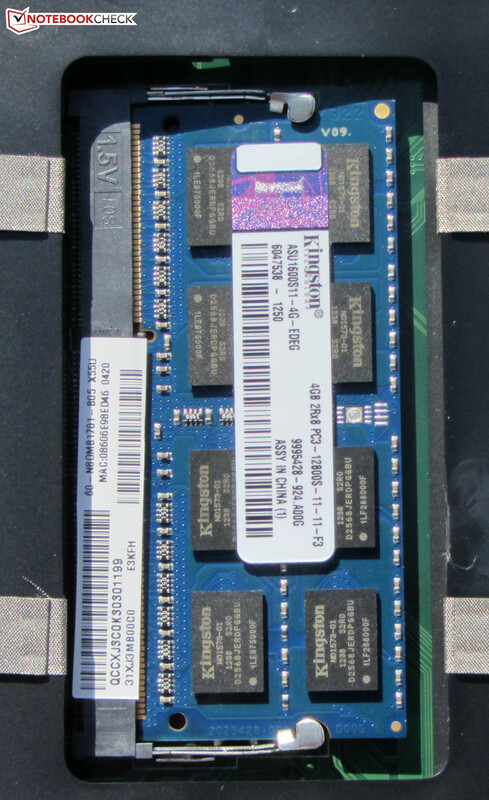 A Solid State Drive would definitely improve system and application performance. To check, we replaced the hard drive with a used SSD (Corsair Nova V32 - 32 GB), installed Windows 7, and repeated the PC Mark 7 benchmark test: the performance increased by 52% (1771 points). Asus uses a conventional hard drive manufactured by Hitachi. The hard drive - a member of the Travelstar Z5K500 family - features a rotational speed of 5400 RPM and a capacity of 500 GB. As always, Asus partitions the hard drive: the OS partition is 186 GB, the data partition is 258 GB and 20 GB is reserved for the recovery partition. CrystalDiskMark and HDTune report an average read speed of 96.49 MB/s and 80 MB/s, respectively - quite good for a 5400 RPM hard drive. The access time of 21.2 ms is a bit too high though. 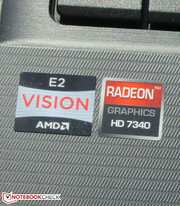 The GPU - a Radeon HD 7340 - is part of the APU. The entry-level graphics processor supports DirectX 11 and features a base clock speed of 523 MHz. AMD Turbo Core can overclock the GPU to 680 MHz. The results of the benchmark tests offer no surprises: the Aspire (AMD A6-4455M, Radeon HD 7500G) has the most powerful GPU and therefore receives the best scores; the Satellite (Celeron 1000M, HD Graphics) garners the second spot, the X55U comes in last. A look at the frame rates makes it clear that the AMD APU just isn't powerful enough to play the current crop of games without stuttering. Even FIFA 13 - which certainly isn't very demanding - doesn't run smoothly. 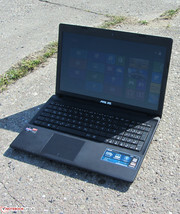 This particular APU wasn't really developed for this task though, so users interested in gaming need to look elsewhere. 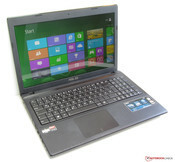 Two options are the 15.6-inch notebooks Aspire E1-571G (Core i3-3110M, GeForce GT 620M) and Packard Bell EasyNote TS11SB-250GE (AMD A8-3520M, Radeon HD 6620G + Radeon HD 7670M). Both systems offer adequate performance at a reasonable cost: the street price is under 500 Euros (~$650). Overall, the X55U is quiet. During idle, we measure a maximum of 31.5 dB. The Satellite (32 to 32.2 dB) is a bit louder, the Aspire (33.7 to 36.2 dB) is significantly noisier. Subjected to medium load levels (3DMark06 is running) and full load (stress test - both Prime95 and Furmark are running), the noise increases to 35.7 and 38.4 dB respectively. In this scenario, the Satellite is less noisy (34 and 37.7 dB) and the Aspire is quite a bit louder (38.2 and 41.9 dB). 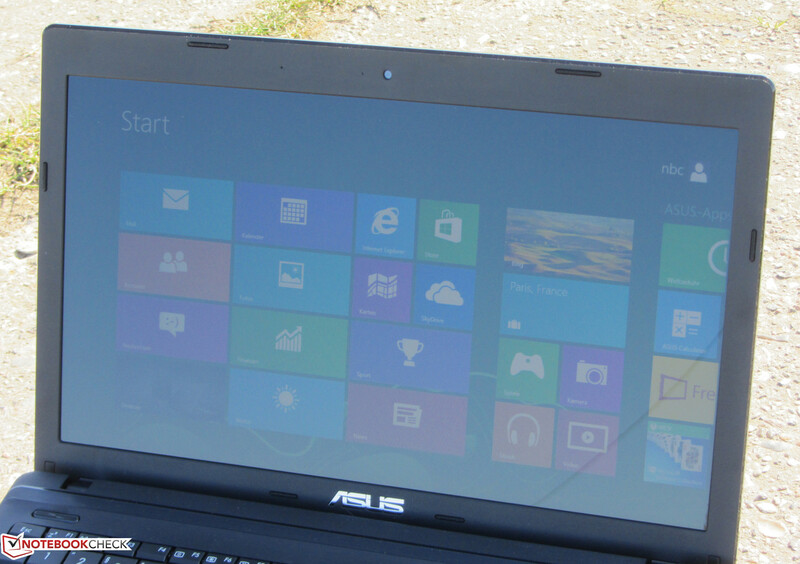 The Asus X55U during the stress test. The X55U remains fairly cool, no matter what load it is subjected to. During idle, the temperature changes hardly at all and remains below 30 °C. Under maximum load, the system gets slightly warmer - we observed between 26.8 and 34.1 °C. The notebook can be used on the lap without any issues. The Aspire shows similar temperatures during idle, but gets hotter under load. The Satellite gets about as warm as the X55U. During the stress test (Prime 95 and Furmark running in parallel for at least one hour), the CPU maintained a clock speed of 1.7 GHz. The GPU operated at 523 MHz - we only saw the Turbo (680 MHz) kick in when Furmark was running by itself. When we unplugged the notebook, the GPU frequency decreased to as low as 283 MHz. With the notebook connected to external power, the CPU temperature hovered right around 63 °C. 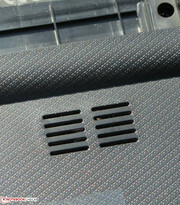 The stereo speakers, which are located on the bottom, get quite loud and produce decent sound. 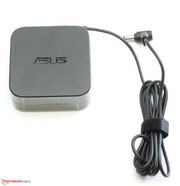 Users who don't like to listen to notebook speakers can always hook up external speakers or use headphones. During idle, the X55U consumes between 9.1 and 12.4 watts - similar to the competitors Aspire (8.3 to 11.5 watts) and Satellite (8.5 to 12.1 watts). Under medium (3DMark06 is running) and high load levels (Prime95 and Furmark are running), the X55U requires 26.3 and 31.5 watts respectively. The power consumption of the Satellite (27.1 and 30.5 watts) is similar; the Aspire (32.6 and 38.9 watts) is more power hungry. 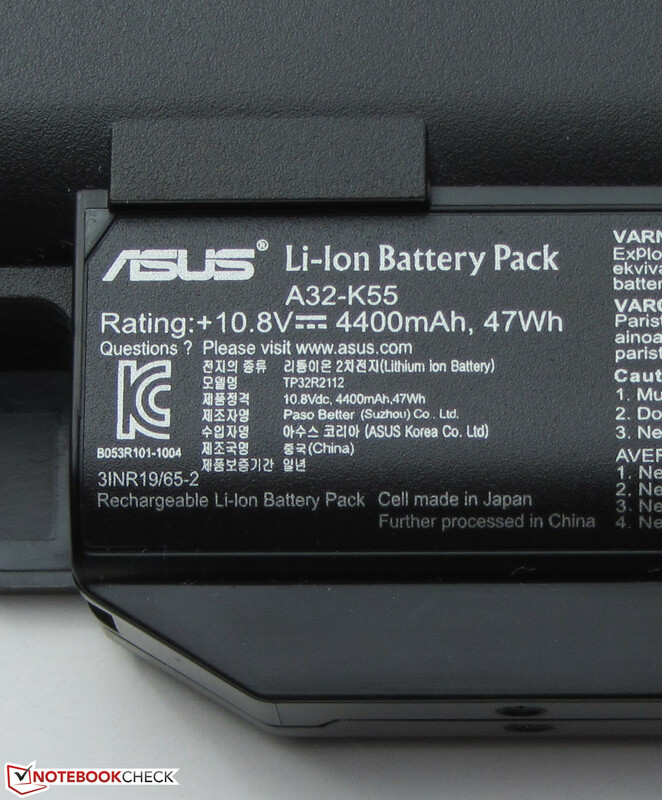 To determine the maximum possible battery life, we use the Battery Eater Reader's Test. We turn the display brightness all the way down, use the power saver profile, and turn off wireless. The X55U lasted 6 hours and 15 minutes. The Aspire didn't run quite as long (5 hours 26 minutes); the Satellite lasted a bit longer (6 hours 24 minutes). Under load, the X55U ran for 1 hour and 51 minutes before we had to plug it back in. Both the Aspire (1 hour 18 minutes) and the Satellite (1 hour 44 minutes) shut down sooner. For the load test, we use the Battery Eater Classic test. 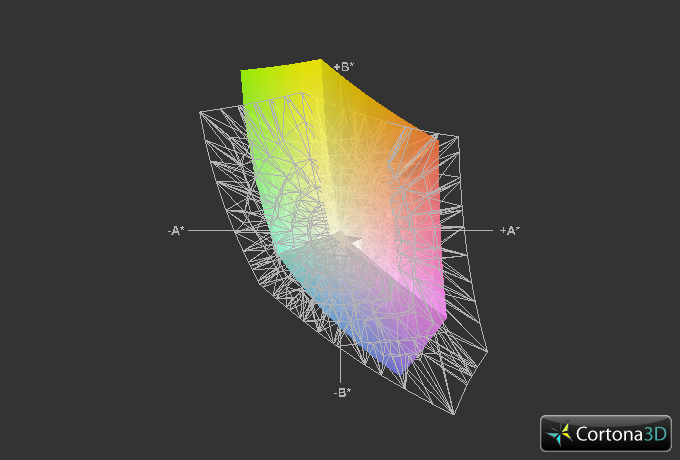 Here, we set the display to maximum brightness, enable the performance profile, and turn on wireless. The WLAN test simulates a more realistic scenario. We set the display brightness to 150 cd/m2, activate the power saver profile and then run a script which visits a different website every 40 seconds. The X55U lasted for 3 hours and 43 minutes. The Satellite lasted slightly longer (3 hours 47 minutes), while the Aspire fell behind (3 hours 19 minutes). The X55U lasted 2 hours and 46 minutes during our DVD playback test. Neither one of the competitors managed to surpass the 3 hour mark, either (Aspire: 2 hours 34 minutes, Satellite: 2 hours 59 minutes). For this test, we activate the power saver profile (or choose a different one if the playback isn't smooth enough), turn the screen brightness up to maximum, and deactivate wireless. It's not really surprising that the Aspire didn't last as long as the other notebooks: its battery only supplies 37 Wh (Asus: 47 Wh, Toshiba: 48 Wh). All things considered, the battery life of the X55U is somewhat disappointing: it's comparable to the Satellite, which doesn't feature a ULV CPU. The E2-1800 APU is capable of achieving longer runtimes with the same capacity battery - see our review of the Lenovo G585. This notebook lasted 4 hours and 1 minute during the WLAN and 5 hours during the DVD playback test. 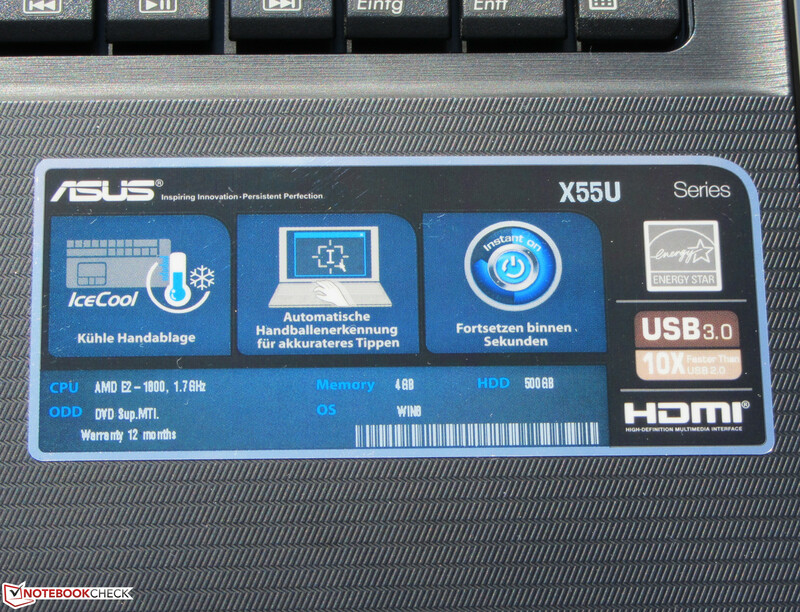 The Asus X55U-SX052H remains both cool and quiet when performing typical daily tasks. The system doesn't consume a lot of power, the display offers ample contrast, and the price is quite low. Negative aspects are the clattery keyboard and the rather short battery life. The Toshiba Satellite C850-1LX is worth a look if the user finds that the X55U would fit the bill, but just isn't powerful enough. 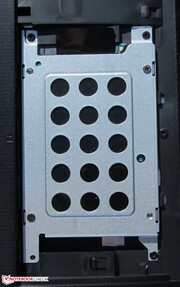 The DVD-RW drive handles all types of media. The hinges hold the display lid securely in any position. ... and has a capacity of 47 Wh. The speakers from Altec Lansing are located on the bottom. 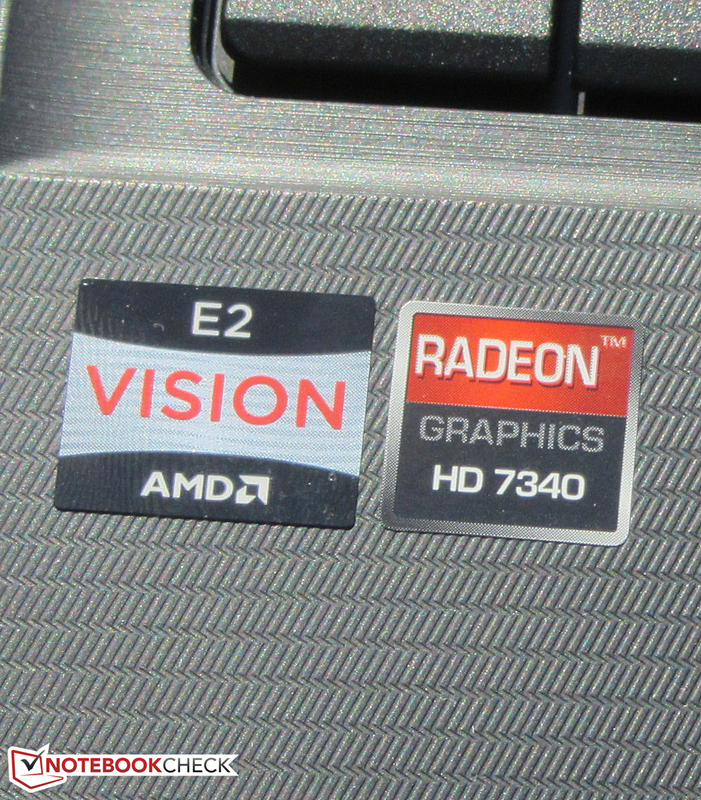 The notebook uses AMD components. The contrast ratio of the display and the low system noise. Better battery life. We would also appreciate a brighter display. 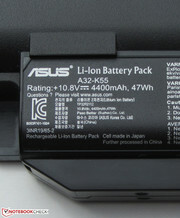 Despite the frugal AMD APU, the battery life of the X55U is average at best. Toshiba Satellite C850-1LX, Acer Aspire V5-551, Samsung Series 3 355E5C-S02DE, Lenovo B590, HP Compaq Presario CQ58-350SG, Lenovo B575e, Asus F55A/X55A, HP 650, Fujitsu LifeBook A512, Dell Vostro 2520, Acer TravelMate P253-M.